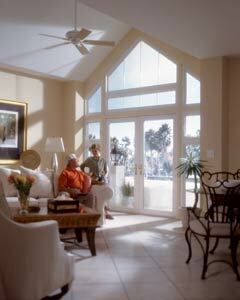 Express your view of the world with unique shapes and designs using picture and geometric shape windows. Whether used on there own or in conjunction with other styles, Picture and geometric windows provide a dazzling effect everywhere they are used. A vast array of grid and glass options opens the door to bold creativity. Choose from a variety of shapes including half-round, eyebrow, circle, oval, octagon, and trapezoid. Or customize your home with a one-of-a-kind pattern of your own creation.